A Unique Feature of AAE Hotels, is our "See Your Way Here" guide. Click here and follow the steps to get to the Victoria or the Rey Don Jaime (across the street) and you can see a step by step photo guide and cheap variations to get from the airport, train station or Metro right to our doorstep! We have 6 locations in Barcelona. But if you're looking for clean and deluxe private rooms in the best location, look no further! 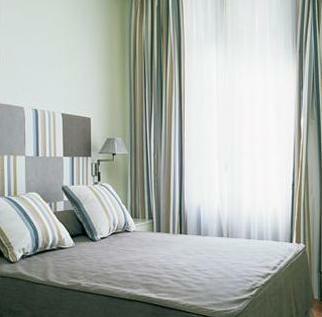 Welcome to the Hotel Annex, one of Barcelona's finest and most affordable priced hotels. We offer luxury and comfort nestled in the heart of Barcelona's "Barrio Gotico" and well communicated with every corner of the city. Free wifi and direct dial phones add great value to each room. Arriving from the airport is easy, simply take the Renfe directlyfrom the airport to Plaza Catalunya for as little as 70 cents, or the airport shuttle will drop you off one block awayl for less than 3 Euros. As if the incredibly central location wasn't enough, our attractive rooms offer hotel quality at hostel prices. With a friendly atmosphere and travelers from around the world, you can't lose staying at AAE's Hotel Annex. Click on Map and Directions Page at top. The Annex Hotel is adjacent to the AAE Rey Don Jaime, where all check ins are done. The AAE Annex is our nicest deluxe budget hotel. We offer private ensuite rooms at hostel prices in the best location!